No-Bake Cheesecake Parfaits are made with layers of silky no-bake cheesecake, graham cracker crumbs, and toppings of your choice. They are one of the easiest desserts you'll ever make! 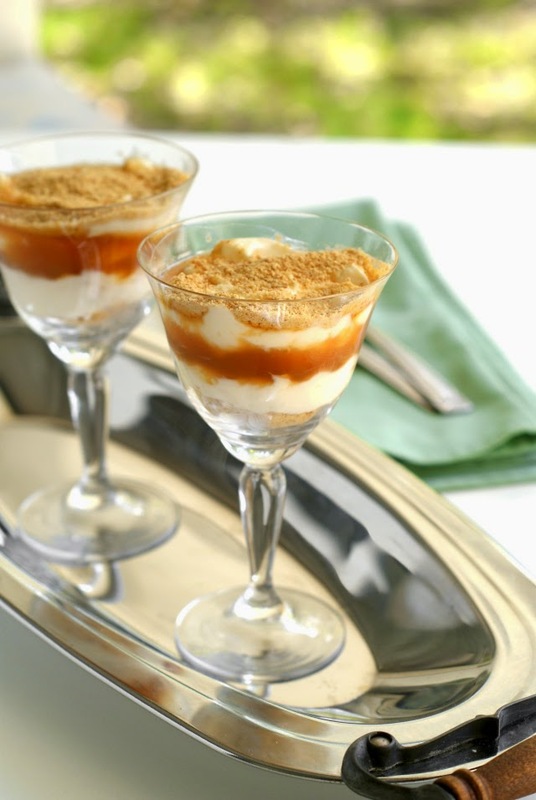 These parfaits are seriously the prettiest little things with very little work! So darn easy to make and so darn good to eat! When you think cheesecake, or at least when I think cheesecake, I think of a baked in the oven, cross your fingers it doesn't crack, creamy cake. Well, this cheesecake is none of those things. Let me explain. This is a no-bake recipe. That's right, all the cheesecake goodness you love without heating up the oven. And this takes waaaay less time to prepare than an oven cheesecake. The texture is more of a thick mousse than a cake, but the flavors are fab and just what I love about classic cheesecake. Also, you don't have to worry about getting your finicky cheesecake just perfect so it doesn't crack. As a matter of fact, with these parfaits, you can be as messy or as neat as you'd like with your layering and you're almost guaranteed not to screw it up. Works for me! Add the topping of your choice to this delish no-bake cheesecake and you have a dessert wothy of holidays, special occasions, or just because! Using an electric mixer, beat the cream cheese, sugar, and vanilla until smooth. Fold in the sour cream with a rubber spatula. Cover and refrigerate for at least one hour. Layer the cheesecake, graham cracker crumbs and toppings in whatever order you like! My layers were: crumbs, cheesecake, caramel sauce, cheesecake, crumbs. Yummy! I had a friend in high school who always brought in his mom's 'famous' cheesecake when she made it, and it's still the very best I've ever had. She used sour cream too. I bet these are amazing! Caramel is totally the way to go. Omg, after searching page after page online for "no bake cheesecake without cool whip,heavy cream, condensed milk or gelatin" I have stumbled upon your recipe! Thank you so much for posting, it is exactly what I've been searching for!